Our Lady of Victories Church. Please see the Church website (external link) for more information and news. Our Lady of Victories is part of the Nottingham Catholic Diocese and serves the Catholic Community for Market Harborough and District. 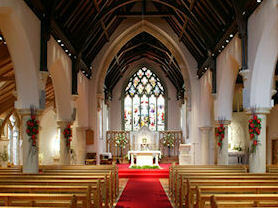 Our Church was built in 1877 and has served the parish wonderfully for more than 120 years. Between the passing of the Catholic Emancipation Act of 1829 and the Restoration of the Hierarchy in 1850, a Chapel was established in an upper room of a cottage behind the Angel Hotel on the High Street, owned by William Flint. Through a legacy left to him by Christine Nevil of Nevil Holt, an old recusant family, a church was built on land donated by his son James, in 1877. It was designed by C.G. Wray in red brick with Bath Stone dressings and stripes, together with reticulated windows and a tall bell tower and spire. The church was originally named St. Mary's and was intended to be a centre of pilgrimage for a wooden carving called Our lady of Moorsele, dated 1687. Market Harborough was not easy of access, geographically, for pilgrimage and the carving was translated to St. Wilfred's in York. The church was then rededicated to 'Our lady of Victories'; commemorating the famous sea battle of Lepanto in 1571. In 1898 P.P. Pugin, son of the renowned Victorian architect, N.W.N. 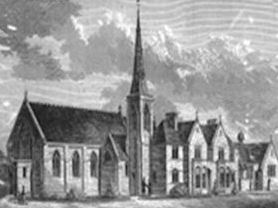 Pugin, designed the sacristies and the cloister which then connected the presbytery with the church proper. Over the years, various Parish Priests and benefactors have added to the building i.e. Stations of the Cross, Stained Glass Windows, Narthex and various extensions and improvements. 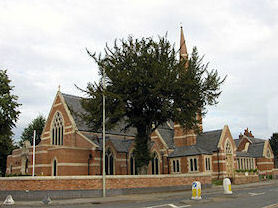 In 2002 it was decided to extend the church due to the increased size of the congregation.